Enterprise server systems from HP ProLiant, Dell PowerEdge and IBM/Lenovo are upgradeable and configurable with a wide variety of embedded server cards. Bargain Hardware have extensive stocks of cheap refurbished ESCs that will get you the most for your money. The vast majority of enterprise servers are highly flexible with multiple PCIe 3.0 expansion ports for single port, dual port and quad port cards interface cards from a plethora of manufacturers such as Qlogic, Broadcom, Brocade, Emulex and LSI. Available both at component level and in configurable systems are a range of Converged Network Adapters CNA's, Infiniband HCA's, Fibre channel HBA's and Ethernet NIC server Gigabit server adapters for OEMs such as HP ProLiant, Dell PowerEdge and IBM System X. 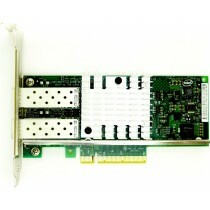 Expansion cards from new are very expensive to buy, especially in bulk, used full-height and half-height expansion cards come at a significant discount and with no moving or serviceable parts and thorough testing are just as reliable as new. Bargain Hardware have large stocks of network card adapters from industry leading manufacturers available on next-day shipment worldwide at the cheapest prices available. Can't find what you're looking for? Contact Bargain Hardware's expert sales team via email, live chat or on +44 (0)1254 878801.